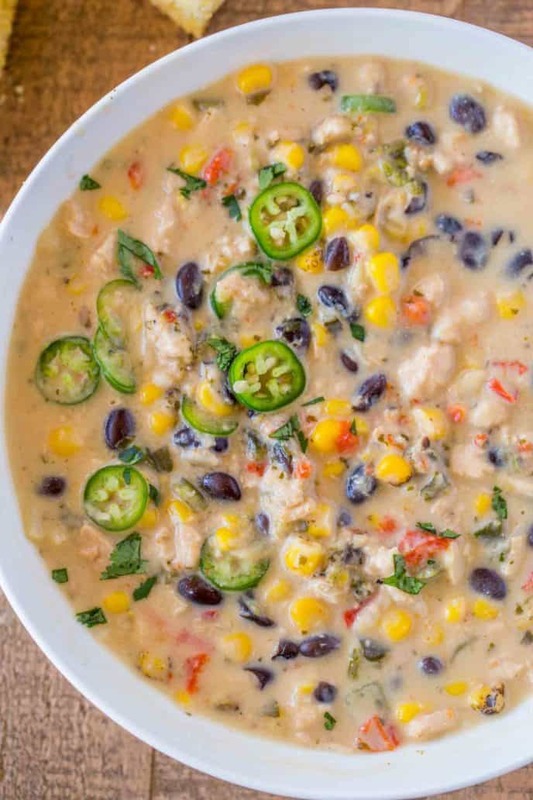 Creamy Chicken Poblano Pepper Soup made with red bell peppers, corn, black beans, roasted poblano peppers and lime finished off with a bit of cream. 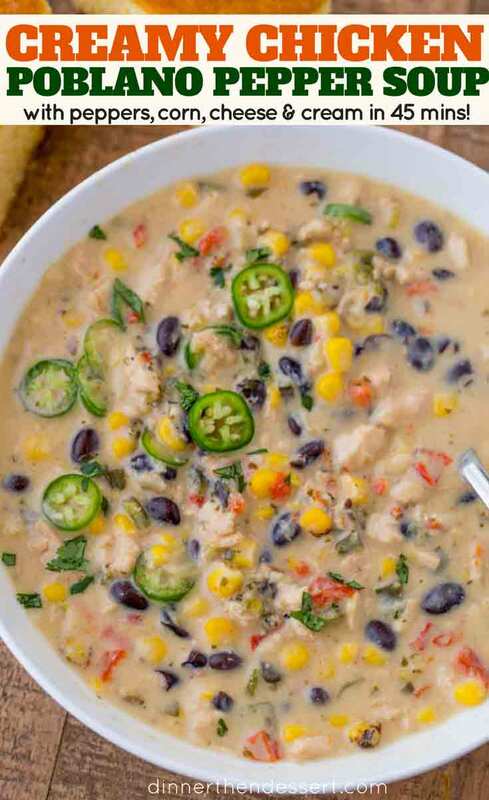 Creamy Chicken Poblano Pepper Soup is a hearty soup perfect for your winter dinners or even in the summer served in bread bowls. The soup itself is done in 45 minutes, but this is also because the chicken and peppers are roasting while the rest of the soup is being made. 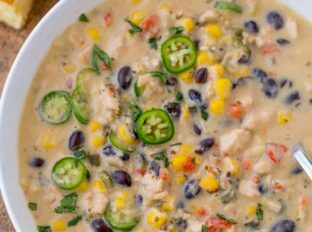 One of my favorite things about this soup is that the chicken and the poblano peppers are roasted in the oven. For an added shortcut and flavor I use the fire roasted corn from Trader Joe’s and canned beans. If you find you want to cut down on some of the fat in the dish I’ve also successfully skipped the flour/butter mixture in favor of putting 2 corn tortillas in the food processor and adding the crumbs to the soup to help give it a thicker texture. 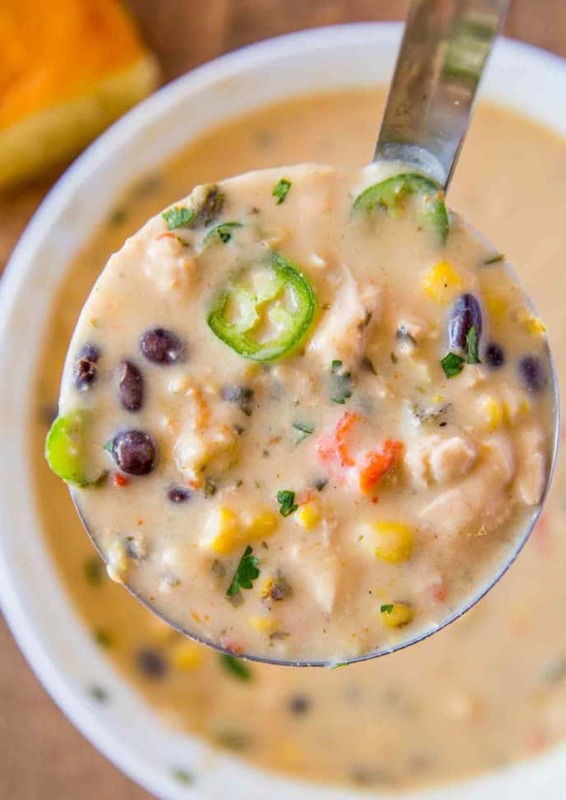 To add acidity and balance to the soup I use lime juice, but I also love serving the soup with additional lime wedges. Sometimes we also sprinkle on some lime zest and serve the soup with crumbled chips or sour cream on top. Make the soup only leaving out the cream at the end. Freeze in small portions. When reheating, heat on a medium heat and when the mixture is just below a boil add in the cream to finish the soup and garnish as desired. 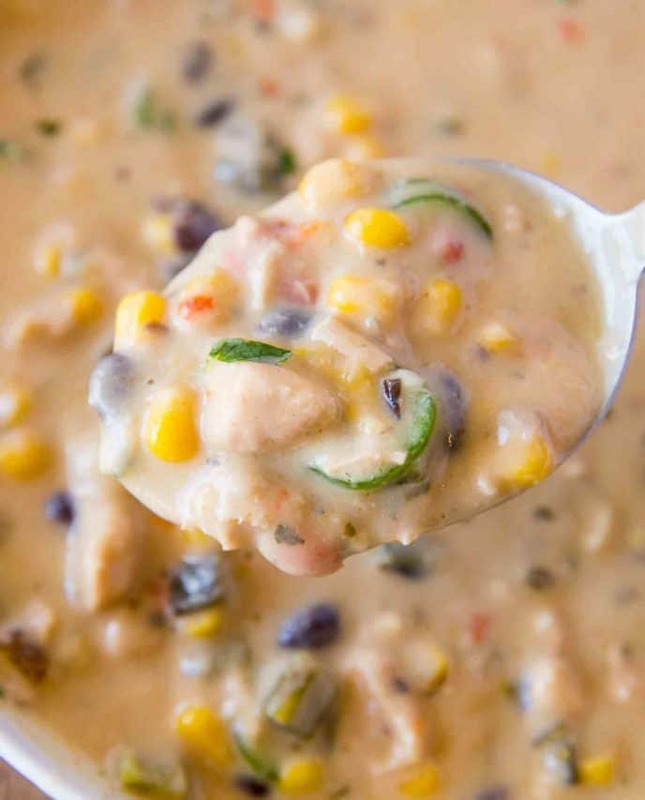 Add the ingredients to the slow cooker (roast the peppers if you can, leave chicken raw – use boneless/skinless) except for the butter, flour and heavy cream. Add in 4 corn tortillas (that have been processed into crumbs) in place of the butter and flour and leave the heavy cream/half and half out until the final 15 minutes. Turned out really tasty! I took some liberties with the recipie like do everybody’s based on what i had at home. Added 2 small onions, 4 small carrots, close to a cup of chopped celery, 2 small cans of lentil soup, 1 turnip, 4 corn tortillas finely chopped, 1 small can of hominy instead of sweet corn, 2 balls of fresh mozzarella instead of Monterey Jack, because i didn’t have any. Used evaporated milk instead of cream. Oh and i ran out of chicken better than bouillon so used 2 teaspoons of beef instead to boost it along. Did add 3 smoked chipole peppers i nto the pot instead of hot chilli peppers! So glad you were able to customize it to what you had on hand. Love it! Marvelous! Made about 6 weeks ago, since made more than we could eat at the time, froze before adding final garnishes in step 8. Enjoying fabulous leftovers tonight – re-heated beautifully! I love when I have a freezer stash of favorites! All the deliciousness without the work, haha! So glad you enjoyed it! Made this soup today and everyone loved it, it was tooooo good. Bet it will be even better tomorrow. Next time I am going to add a couple jalapeños while cooking. Garnished was good though. I definitely will make again. Made this yesterday after searching for a homemade version of my favorite soup from Saladworks. Long story short, this was delicious and even better than Saladworks (of course!). But my only issue is that even after draining my black beans, my soup turned an unappealing purple/grey color when I added the beans. (Did not stop us from eating and enjoying). Any tips for keeping it more off white than off purple??? Will definitely be making again!!! I’m so glad you enjoyed it! Next time, you can try and drain and rinse the beans before adding. Hope this helps! 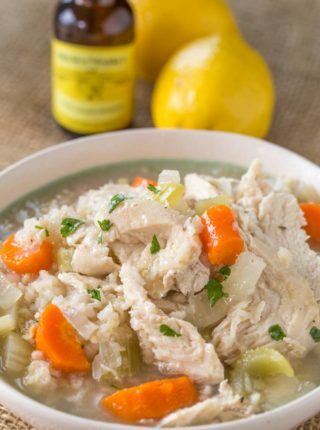 We loved this soup! Next time I think I’ll drain the beans before adding. It is simply FABULOUS. Thank you for sharing ? So glad you enjoyed it! Thank you for the 5 star rating! Hi! 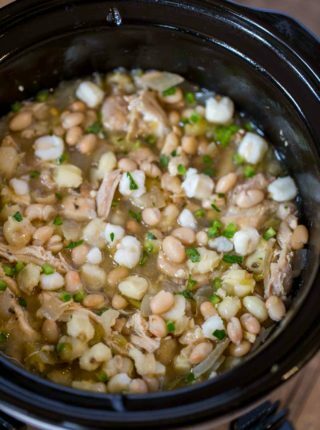 How long do you cook the soup for in the slow cooker and at what setting? I’d cook in in a slow cooker on low for 6-8 hours. Enjoy! We thought it would be too hot for us but, oh my gosh, we ended up loving it. Especially with a squeeze of lime! Thanks for a great recipe. So glad you enjoyed it Marie! I made this tonight and it was just what i was craving!!! I had most ingredients on hand . The only thing i did different was use 5 frozen chicken thighs instead of breasts and i boiled them from frozen for about 45 minutes before shredding them. Topped it off with sliced jalapeno cilantro and some crumbled corn chips. This is my kinda comfort food!! Did you drain the beans or use the whole can with liquid? Thank you! I didn’t drain the beans, just poured them in. 🙂 Enjoy!! *****This was fantastic!! I used the grilled frozen corn from TJ’s. I think next time I’ll substitute the self roasted pablano peppers for canned. My family loved this so much that they were still asking if there was soup leftover to eat, two days after it was all gone. ?? That’s a good sign of a winning meal!! 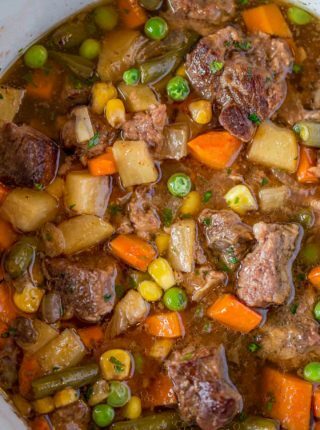 Do you have the recipe for a slow cooker? This looks so darn good. I can’t wait to make it. Perfect for a chilly night! So flavorful! This is mouth watering! Sounds like a new favorite soup! I am going to try this without chicken! The flavors sound so delicious! I love a soup that has some heat. mmmm..this looks so comforting and delicious!! 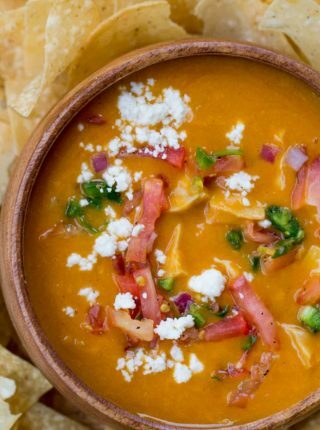 Perfect for the cold weather! I am in love with this recipe! 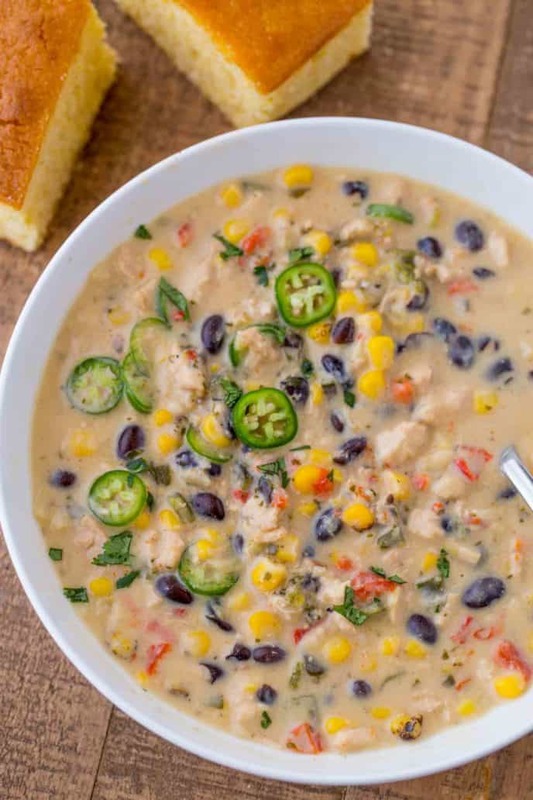 The soup looks simple, delicious and hearty! I am such a sucker for a good bowl of soup! I like the little added heat!